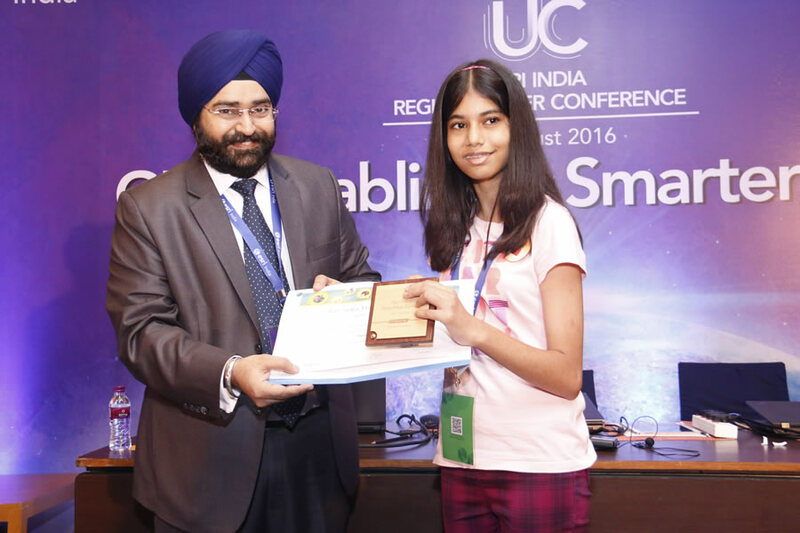 Harpreet Singh from Esri India presents the third place award in the Esri India Story Maps Contest to Mahika Srivastava. 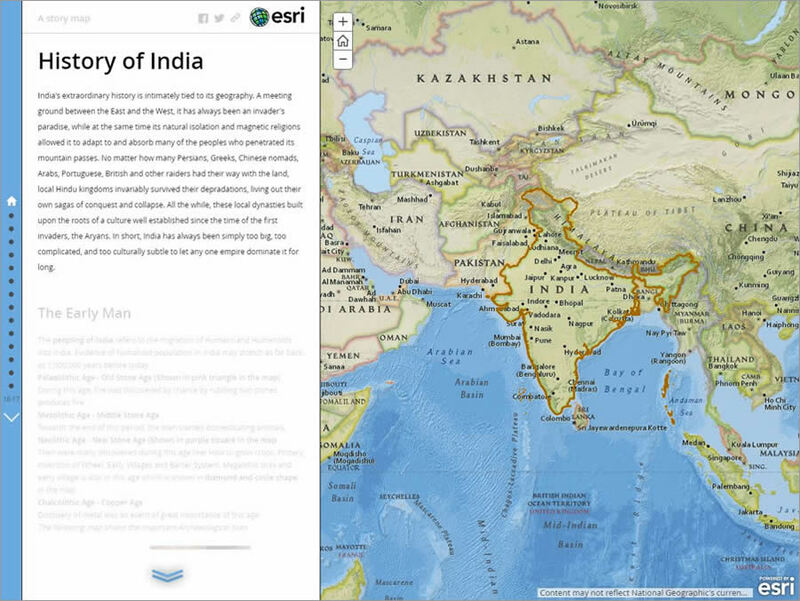 Eighth grader Mahika Srivastava combined her interest in history and geography when she created History of India, a story map that won third place in the Esri India Story Map Contest. 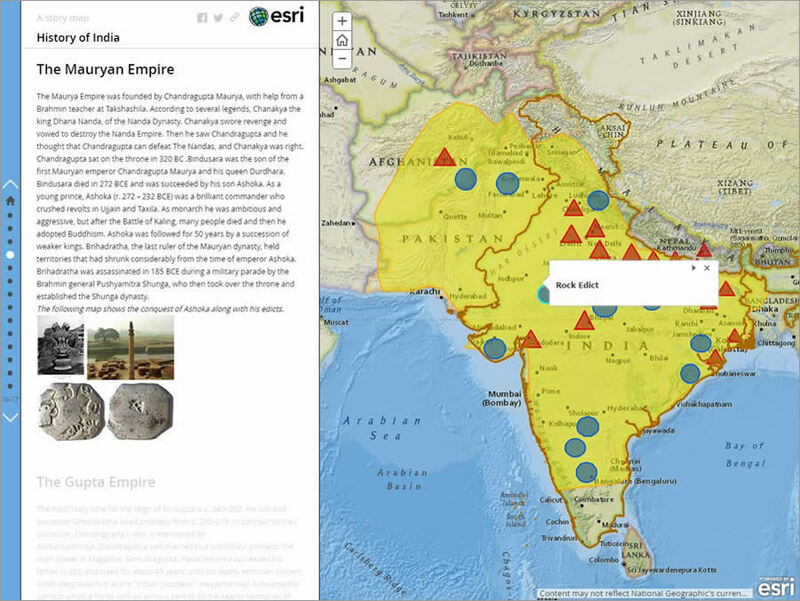 A student at Scottish High International School in Gurgaon, India, Mahika used an Esri Story Map Journalto go back in time and show, on maps, the location of some of India’s archaeological sites and early civilizations, empires, kingdoms, and dynasties. 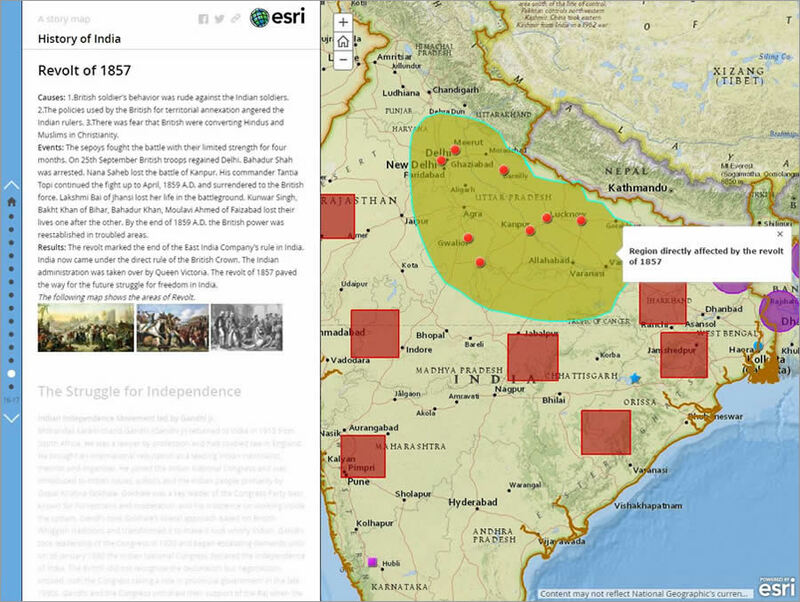 The story map also displays where major wars and revolts occurred, concluding with a map that marks the birthplaces of the leaders of India’s independence movement. Her classmates liked the story map because its visual and interactive nature made history come alive, according to Mahika. 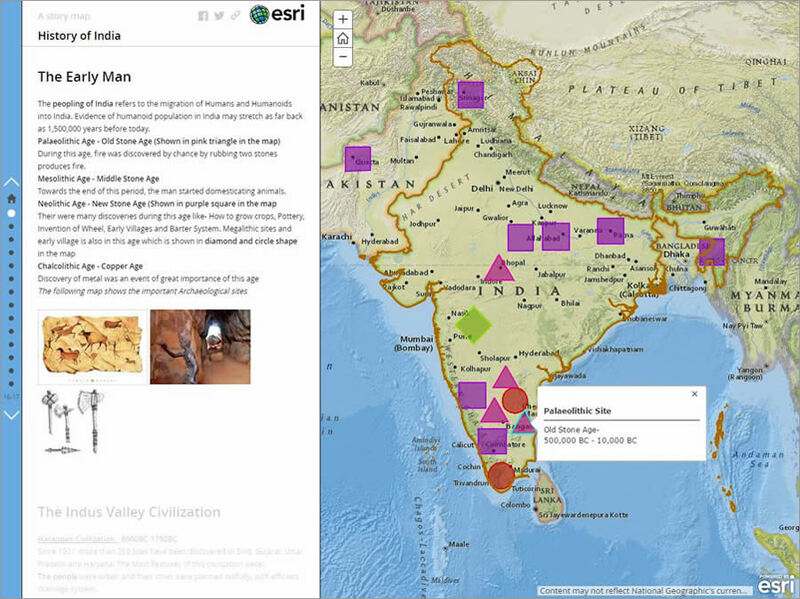 Mahika gives a presentation about her History of India story map to the audience at the Esri India Regional User Conference. For the text portion of the story map, Mahika inserted passages from the book The Puffin History of India, by Roshen Dalal; history textbooks at school; and Wikipedia and other online sources. She listed her sources in the acknowledgments section at the end of the story map. 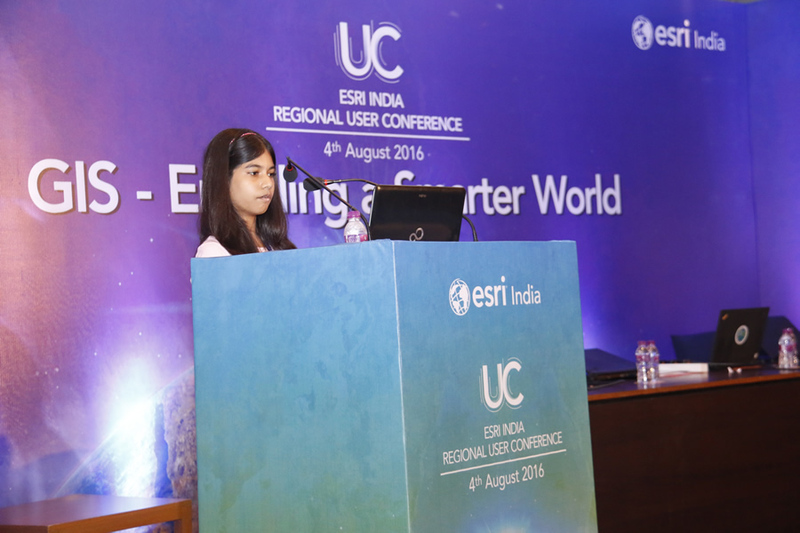 Mahika collected her third-place prize in August at the 2016 Esri India Regional User Conference in Begumpet, Hyderabad, India. While there, she spoke with Rashmi Gupta from the Esri India marketing team. Gupta: Why did you focus on India’s history as your story map topic? Mahika: While I was reading history, I always imagined the regions and territories of the various rulers. I started drawing kingdoms and territories of various kings and empires on paper, but that was a very lengthy process, and keeping them in a series was cumbersome. 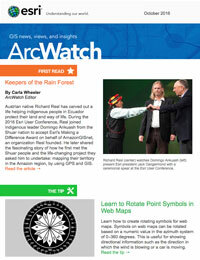 I learned about ArcGIS Online during my last summer vacation, and I explored it a bit. I thought it would be a good idea to use the story map apps in ArcGIS Online to learn about history. 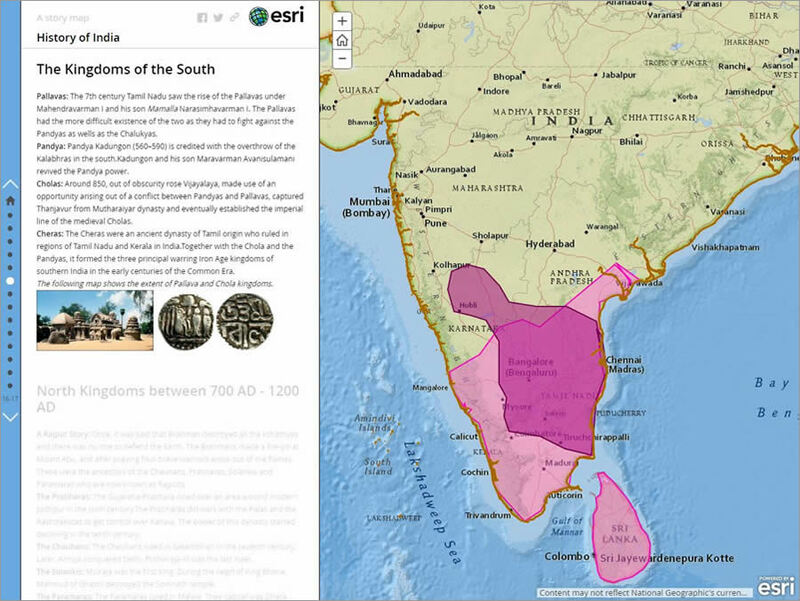 I prepared various maps and created the History of India story map, which I also submitted in the Esri India Story Map Contest. 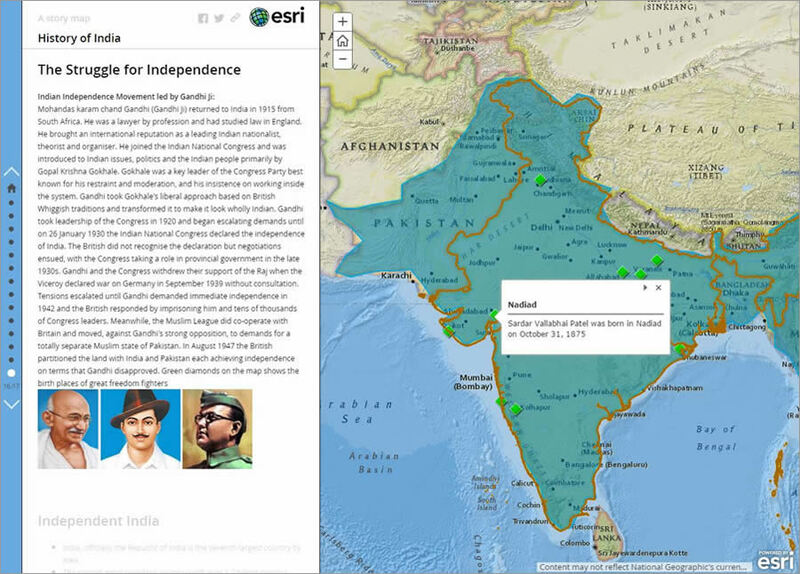 Mahika wanted to highlight India's history using an Esri Story Map Journal. The symbols on the map mark various ages in history, including the Paleolithic and Neolithic ages. Gupta: Tell me more about your story map. Mahika: My story map is a glimpse of Indian history, starting with the Stone Age and early human settlements on the Indian subcontinent. My story map shows the territories of various empires and the periods in which the leaders of those empires ruled. I also briefly mentioned their impact on history and included images of coins and artifacts from those empires. My fellow students now use the story map as a good reference and an interesting way to study and understand history in a geographical way. The portions of the map colored in yellow were part of the Maurya Empire founded by Chandragupta Maurya about 322 BC. Gupta: Did you face any challenges while making the story map? Mahika: Drawing the regions and territories manually was a challenge. I had to redo the map many times, as precision is the important element of making any map. I also took a lot of time gathering information about the territories, as I found slight differences in versions of history told by the various authors. Gupta: How did you solve this dilemma? Mahika: I prepared the maps by zooming in and trying to be as accurate as possible. To minimize the differences in the information provided by various authors, I chose to include text from the most authenticated sources like my school textbooks. Gupta: Why did you choose the Esri Story Map Journal app to make your story map? Mahika: I picked the Esri Story Map Journal app because I found it very convenient to put the text and the maps side by side. You can explore the map by clicking on it and zooming in while cross-checking the information on the left panel. And it was easy to use this app, thereby making my work even more convenient. Mahika mapped the Chola Empire. Gupta: How long did it take for you to complete the story map? Mahika: It took me 15 days to gather the information and make the story map. Gupta: Describe what it was like to make the story map. Mahika: It was a great experience for me because when I started making my story map, I was doing it to learn how to use ArcGIS Online to map historical events. But as I proceeded, I learned more detailed information about Indian history, and now I am well versed in it and with the territories of various Indian rulers. When I had finished making my story map, I realized that I had actually merged geography, history, and computer technology to achieve my goal. I enjoyed presenting my story map to my principal, teachers, and more than 200 students at Scottish High International School and to the audience at the Esri India Regional User Conference. Gupta: Did you enjoy creating a story map? Mahika: Absolutely. It was great fun. I love working with software. The best thing was that while I was using and learning how to use GIS software, I developed an interest in history. Now I have become an encyclopedia of history for my fellow students. Everyone looks at my map, and it gives me great pleasure. In 1857, a revolt arose against the British East India Company. The revolt was ultimately put down but many lives were lost. The birthplaces of some of the leaders of India's independence movement are displayed on this map.